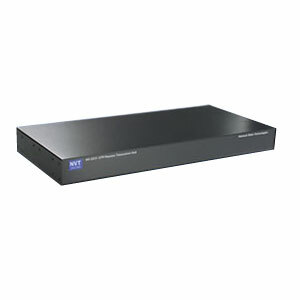 NV-3213 is a 32 port passive transceiver hub that allows transmission of real-time monochrome or color video over Unshielded Twisted-Pair (UTP) telephone wire. Baseband (composite) signals of any type are supported. “Up-the-coax” type signal may be sent over the same wire pair at distances up to 750ft (225m). The unparalleled interference rejection ability of the Model NV-3213 Hub allows video signals to co-exist in the same wire bundle as telephone, datacom, or low-voltage power circuits. Perfect for larger CCTV installations where port density and camera number growth are prevalent. With built-in transient protection, damaging voltage spike problems are eliminated. NV-WMBK Provides convenient wall mounting option for NVT hub products.